Monogram canvas dopp bag for men. Stylish men's toiletry bag for shaving and bath accessories. 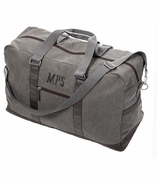 Standard size for travel duffle, backpack or carry-on bag. Available in stone washed chestnut brown. 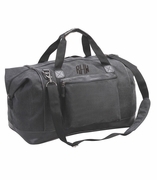 Constructed with two separate zippered compartments. One compartment has two open pockets, the other small zip wall pocket, perfect for a shaver. Contrasting faux leather piping around the edges. If you are looking for a great gift for the man in your life, this is it! 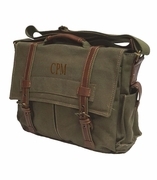 Personalize it with his initials and you have a winning combination of style and functionality. Quality gift for graduation or groomsmen present. Monogram toiletry dopp kit measures 11"W x 6"W x 4.5" across bottom.